1) Tell us a bit bout your background, where you grew up, family, sports, etc? I grew up in Leeds in West Yorshire, England. At age 11 I started doing the 100m sprint where I quickly became one of the fastest kids in my age in the Country. At 13 I began playing rugby league (The English Version of your NFL.) I made it to the national level but had to quit at 17 due to a back injury. That's when I saw some guys benching..I was hooked but my dad would not let me train until I was 18 years old, saying I was too young. As for family, I have an older sister, Rose, who lives in Canada and a younger brother who lives near me. My mum and dad are still living near me in Leeds and my wife of seven months, Stacy, who I met in the US during one of my shows. 2) When did you start training with weights? I started weight training at age 18. Right from the start I was strong. The first time I ever lifted I squatted 500lbs and deadlifted 600 pounds. Lads from the gym thought I had trained before, but no, it was my first time. That's when it all started. 3) What did you do for a living? Well, I do as little as possible, ha ha. I don't want anything to get in the way of powerlifting. But seriously, I do some driving for a photo company and also I sell supplements. (Dorian Yates Approved) As they are my sponsors. 4) When is the 1000lbs deadlift going to happen? 5) Who is the best deadlifter in the world? The best deadlifter in the world is Andy Bolten. Nobody has pulled as much as me. I also hold the world record deadlifting 971lbs. 6) What has made you one of the best? Hard work. I never ever give up and never will. If I have a training problem I will make sure I seek the best possible person to help me and I work 110% until I get it right. I have passion for this sport. It's what I am. 7) I will say a same, tell me what jumps in your head. Garry Frank-- Awesome strength but needs to be more consistent. A nice guy. He has so much power- very hard to beat. Donnie Thompson- He has made big jumps in last two years and is now a big threat. Kieran Kidder- The man who made it all possible. 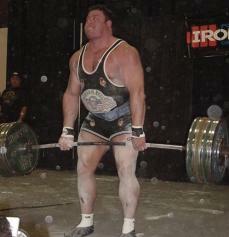 He gave us the WPO and without him powerlifting would not be the same. Ed Coan- A legend. What else can you say? The man is awesome. He helped me at the 2003 WPO and it was an honor. 8) How is powerlifting in England different from powerlifting in the United States? What improvements can be made in the US? Here in England powerlifting is a very small sport and not very well known. In the USA it seems everywhere you go somebody knows who you are. I am not sure if I would make anymore improvements in the United States. I would like to make more of a lifestyle change--settle in the USA, and who knows, do a 300lbs total someday. 9) So the rumors of you relocating to the United States are true? Yes, that is true. My wife of one year is originally from the Boston area but some of her family live in Florida. Sine I know some lifters down there it would be perfect. We would probably move to Tampa Bay. 10) Is there anyone you would like to thank? Yes, I would like to thank a few people who have supported me along the way: Dorian Yates Approved/CNP, Brian Batcholodr, Kerry Kayes, Dave Beattie, Forza and Metal. I would also like to thank the guys from Leeds where I live and train. Finally Sgt. Rock and John Inzer for the equipment. Watch out, I will be the first person to hit a 1000 pound deadlift.